According to the American Cancer Society, skin cancer is the most common type of cancer, accouting for half of all cancers in the United States. Fortunately, most skin cancers are highly curable with early detection and treatment. The surgeons at our Birmingham, Alabama plastic surgery center use specialized techniques for Skin Cancer Removal to remove cancerous and other skin lesions while preserving your health and appearance. By choosing a member of the American Society of Plastic Surgeons (ASPS) for your skin cancer removal procedure, you can be assured that you are choosing a highly-trained, board-certified plastic surgeon. ASPS Member Surgeons must meet rigorous standards for training, ethics, physician practice and research in plastic surgery. Your type of skin cancer. The likely outcomes of your treatment and any risks or potential complications. Discuss the likely outcomes of surgery and any risks or potential complications. Be sure to ask questions at your consultation. 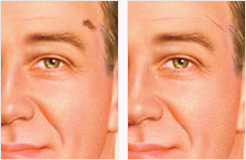 It is very important to understand all aspects of your skin cancer removal procedure. It's natural to feel some anxiety. Don't be shy about discussing these feelings with your plastic surgeon. Damage to deeper structures (such as nerves, blood vessels and muscles), which may be temporary or permanent. Systemic spread of skin cancer. Skin grafts have an added risk that the graft may not "take" and additional surgery may be necessary to close the wound. Your plastic surgeon also will discuss where your procedure will be performed. Skin cancer surgery may be performed in a treatment room, accredited office-based surgical facility, licensed ambulatory surgical center or hospital. If your procedure is performed with sedation, be sure to arrange for someone to drive you to and from surgery and stay with you for at least the first night. Depending on the size, type and location of the lesion, there are many ways to remove skin cancer and, if necessary, reconstruct your appearance. Some forms of skin cancer require additional treatment, such as radiation therapy. This section covers some of the possible procedure steps involved in skin cancer removal surgery. Anesthesia choices for skin cancer removal include local anesthesia, intravenous sedation and general anesthesia. Your doctor will recommend the best choice for you. A small or contained lesion may be removed with excision, a simple surgical process that is performed to remove the lesion from the skin. Closure is most often performed in conjunction with excision. A skin cancer lesion that is particularly large, is being removed with frozen sections, or is likely to cause disfigurement may be reconstructed with a local flap. Adjacent healthy tissue is repositioned over the wound. The suture line is positioned to follow the natural creases and curves of the face, if possible, to minimize the resulting scar. Your doctor will give you specific instructions on how to care for yourself. Following your physician's instructions is essential to the success of your skin cancer removal surgery and recovery. After your skin cancer has been removed and any primary reconstruction is completed, a dressing or bandages will be applied to your incisions. Incision sites may be sore, red or drain small amounts of fluid. It is important to follow all wound care instructions such as cleansing and applying topical medications exactly as directed. Be sure to keep your incision sites clean and well-protected from injury. Try to limit movement that may stress your wound and your sutures. Be sure to ask your plastic surgeon specific questions about what you can expect during your skin cancer removal recovery period. Skin cancer may reoccur. Once you have been diagnosed with skin cancer, you are at a higher risk of developing another skin cancer. Sun exposure may increase risk. It is important to discuss the signs of skin cancer with your physician, regularly perform self-examinations for suspicious lesions and schedule an annual skin cancer screening. Healing will continue for many weeks or months as incision lines continue to improve. It may take a year or more for incision lines to refine and fade to some degree. In some cases, secondary procedures may be required to complete or refine your reconstruction. Sun exposure to healing wounds may result in irregular pigmentation and scars that can become raised, red or dark. Visible scars will always remain at incision sites. You may also see textural, color or other visible differences of the skin in reconstructed areas. Treating skin cancer can be disfiguring in some cases. Your plastic surgeon will make every effort to treat your skin cancer without dramatically changing your appearance. Although every effort is made to restore your appearance as closely and naturally as possible, the most important factor is that your skin cancer is effectively cured. Excision: A simple surgical process to cut the lesion from the skin. Frozen section: A surgical procedure in which the cancerous lesion is removed and microscopically examined by a pathologist prior to wound closure to ensure that all cancerous cells have been removed. 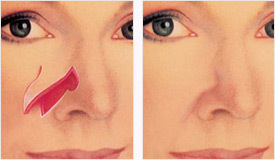 Local flap: A surgical procedure used for skin cancer in which adjacent healthy tissue is repositioned over the wound. Melanoma: The most serious form of skin cancer. Most often distinguished by its pigmented blackish or brownish coloration and irregular and ill-defined borders. Occurs in the deepest portion of the epidermis and, for this reason, is the most likely form of skin cancer to spread quickly in the skin and to other parts of the body. Skin graft: A surgical procedure used for skin cancer. Healthy skin is removed from one area of the body and relocated to the wound site. A suture line is positioned to follow the natural creases and curves of the face, if possible, to minimize the appearance of the resulting scar. The plastic surgeons at Hedden & Gunn Plastic Surgery are experienced in removing skin cancer lesions and techniques to reconstruct your appearance. If you have any questions about Skin Cancer Removal and Reconstruction or to schedule a consultation, please contact our Birmingham, Alabama plastic surgery center today.